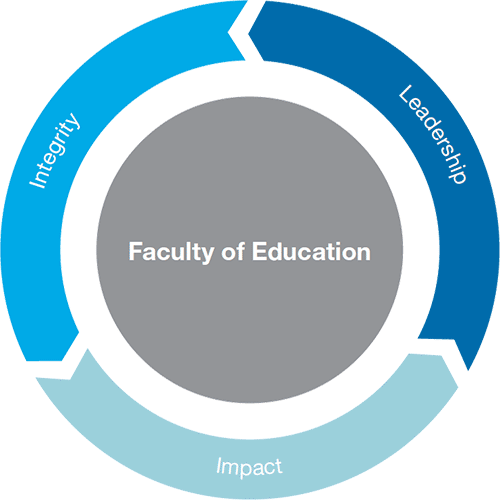 The Faculty of Education is committed to researching, communicating and applying knowledge about teaching and learning in ways that foster quality in education. The Faculty of Education develops and provides innovative research and teaching that takes seriously the global-to-local demands of an excellent Australian public university. Our work focuses on advancing the discipline and practice of education through original research, development and partnership activities. We prepare and develop professionals and practitioners for a range of education settings and specialisations. We also engage policy and public debate on matters of importance to education and educators at all levels. Our mission is to contribute to the public interest through high quality and ethical teaching, research, capacity building and community service. To this end, we create and pursue opportunities that strengthen and sustain a vibrant intellectual community, centred on the purposeful, critical and disciplined study of learning and teaching in a range of contexts. an intellectual, social, physical and web environment that challenges, enthuses and supports all to learn and excel, and which sustains productive working relations characterised by mutual respect, accountability, contribution and recognition.